This email is in support of preserving Upton Farm as a green belt, free of urban development. 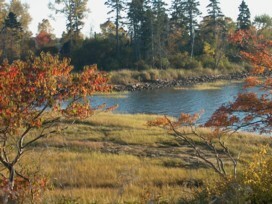 This area of land is located on both sides of the Trans Canada Highway between the North River Causeway and the traffic light by Upton Road and was originally part of the Federal Agricultural Research Farm.The Federated Women’s Institute of Prince Edward Island strongly supports keeping this piece of land as a green space for all Islanders and visitors to enjoy for years to come. The value of this pristine piece of property is immeasurable and it is paramount that it is preserved for future generations. Your support is appreciated as we strive to preserve a part of our heritage and a legacy for our children. This entry was posted on October 24, 2007 at 12:23 pm and is filed under Letters of Support. You can follow any responses to this entry through the RSS 2.0 feed. You can leave a response, or trackback from your own site. It is wonderful to have the Women’s Institute endorse this land for green space. School children might be interested in this location. It is a great place for field trips.